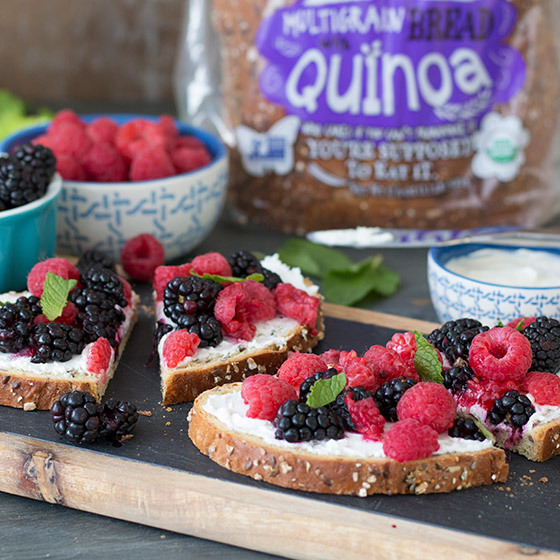 We admit it, when we baked our very first loaf of Organic Multigrain Bread With Quinoa we didn’t have the Smashin’ Berry & Goat Cheese Toast recipe in mind. But perhaps we should have. Before you read any further, note that this recipe does not involve any smashing together of ingredients. We’re pacifists, and bread loathes violence of any kind. So do buns, baguettes, bagels and boules for that matter. This one’s perfect for breakfast, and probably even ideal as a dessert for those with less of a sweet tooth. The nuttiness of quinoa plays well with the freshness of the berries, and yet it’s probably 10 times tastier than it appears in the photo. Actually 100 times tastier, easy. Rinse berries and combine in a medium mixing bowl. Mash some of the berries gently with a fork to release juices and flavor. Spread goat cheese on toast and top with mashed berries. Add fresh mint leaves for extra flavor.